This is the famed photo from the "Surgeon's Photograph" that was discovered to be a hoax. The magazine that I found the most articles from is the Junior Skeptic. It is directed towards children and teens to learn about myths and science from experts. One of the articles I found from them was “Top Ten Busted Myths.” This article was interesting and a little one-sided because they were specifically trying to debunk Nessie’s existence. Nessie was number five on the list of ten myths and the authors really did not want to believe that Nessie was real. That is the biggest issue I have found with articles about Nessie, they are all one-sided, either for or against her. There really is never an article where they are not trying to persuade you to believe on thing over another. Daniel Loxton, the author, states that he wanted to believe Nessie existed, but it is not possible and nor will it ever be. This article is only a page long and he only refutes the evidence in one or two lines, which does not seem credible because he does not offer up a lot of information as to why. He basically refutes the idea of plesiosaurs as a myth because they can live in the cold water and they went extinct millions of years ago. He says others try to say it is different kind of monster, but he could refute those too and then never gives any information on why he could. This article is a nice one to read though because it gives me a perspective of the really staunch non-believers. However, it is not a good article because he does not have a lot of information to back-up his claims. The Junior Skeptic seems to be a magazine that is semi-credible, but interesting to read. Since I was mostly finding articles written for children, especially young boys, it was refreshing to find another good article from the Science New. I mostly chose this article for the title, “Will the Real Nessie Please Stand Up?” because it really made me interested in what the article had to say. I did not know if it was supposed to be a comedic or if it was a serious article, so I was intrigued. 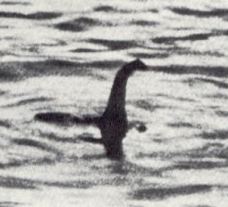 This article was a mixture of both comedy and actual information that provided for a great source about Nessie. Marcia Bartusiak, the author, starts off by saying “Poor Nessie. By now, she must be having an identity crisis” (pg. 122). Bartusiak discusses the many different identities that Nessie has accumulated over the years. She tries to explain all the personas that Nessie has had and how they could be true or they might not be. She does state as one of the main thoughts of the article, that if Nessie does not show herself soon there will never be an end to the rumors (pg.122). Overall this was an article that I would recommend to anyone trying to learn about all the things that Nessie could be. With this article they can form their own opinions about Nessie. That is what I think makes a good article, if they do not force an opinion on you but gives you enough facts to make your own.